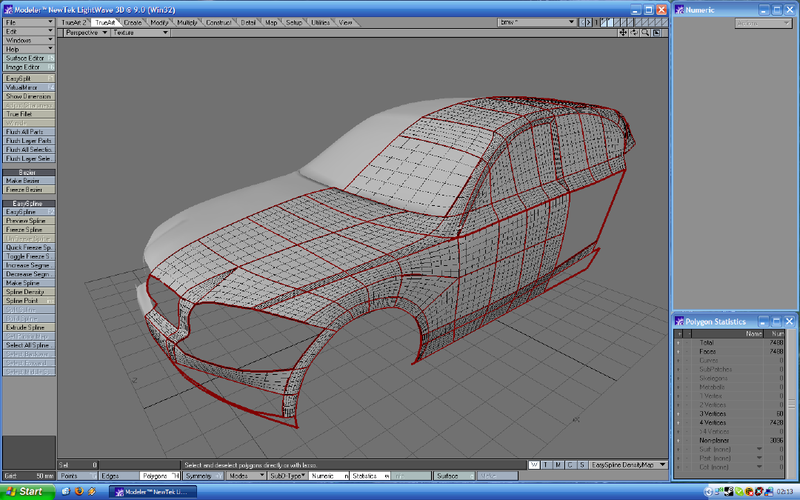 EasySpline is the first complete system for spline modeling made for LightWave ® Modeler. 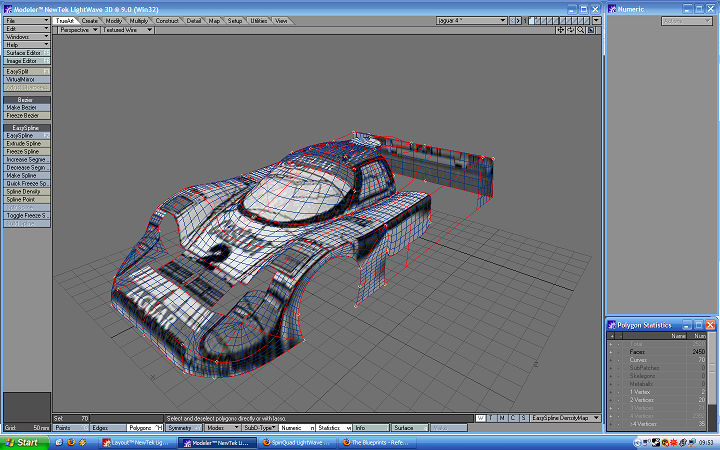 Currently it supports native LightWave's Catmull-Rom curves and TrueArt's freeware true Bezier and B-Spline curves. It gives you chance to combine both type of curves in the same spline patch, as it's presented on fish modeling & texturing tutorial without freezing/converting Bezier and B-Spline to Catmull-Rom! 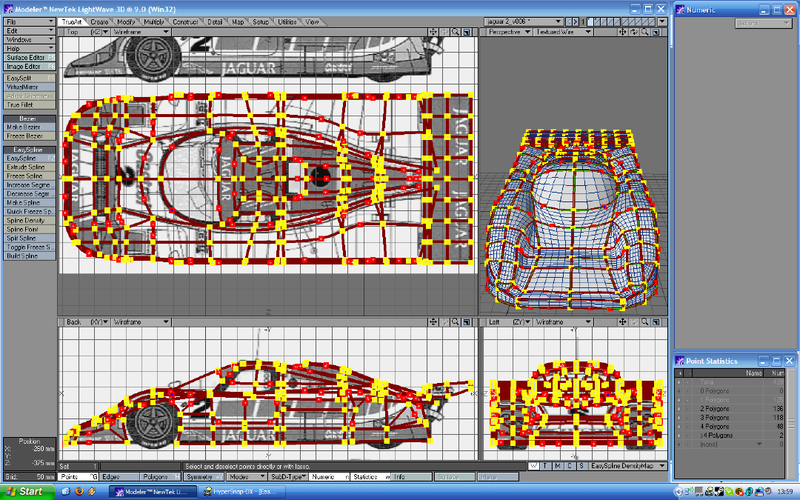 Preview wireframe and geometry of spline cage in the real-time. No more guessing "how it will look after freezing?"! This is unique in LightWave environment technology, known in other 3D packages with more modern architecture. Freeze spline cage to true geometry in just one hot-key press. 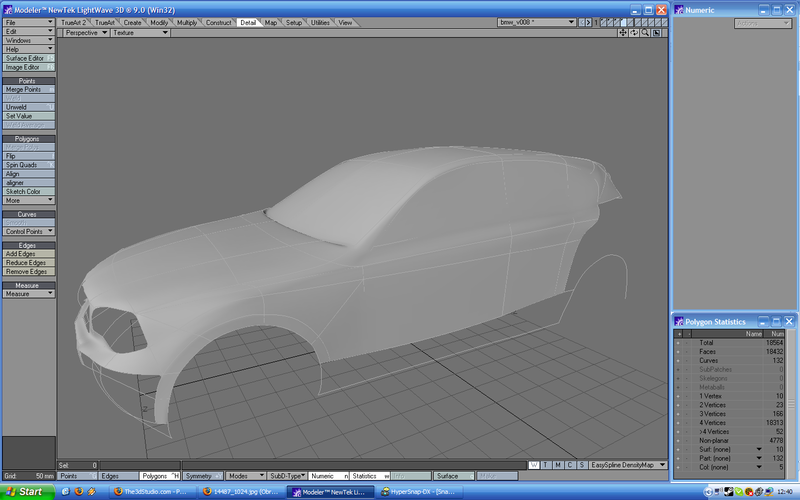 What you normally do in hundered steps in car modeling process, with our tool you can do in one second! And adjust in the real-time number of segments! Support three different curve types Catmull-Rom, Bezier and B-Spline. More to come for client request! 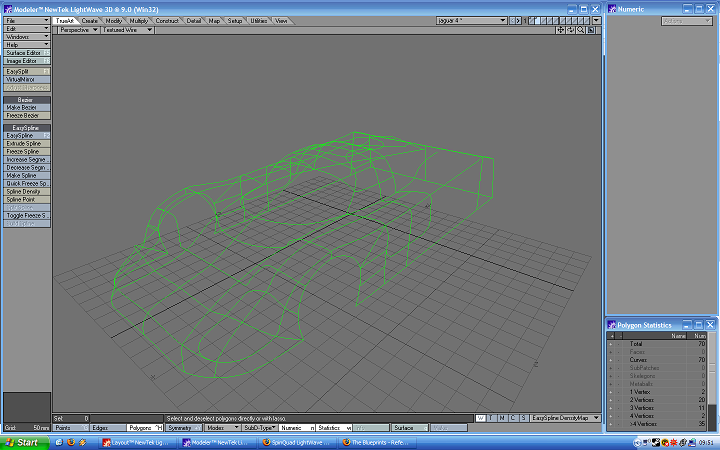 Support for long curves in the real-time patched spline cage, crossing many spline patches at once. 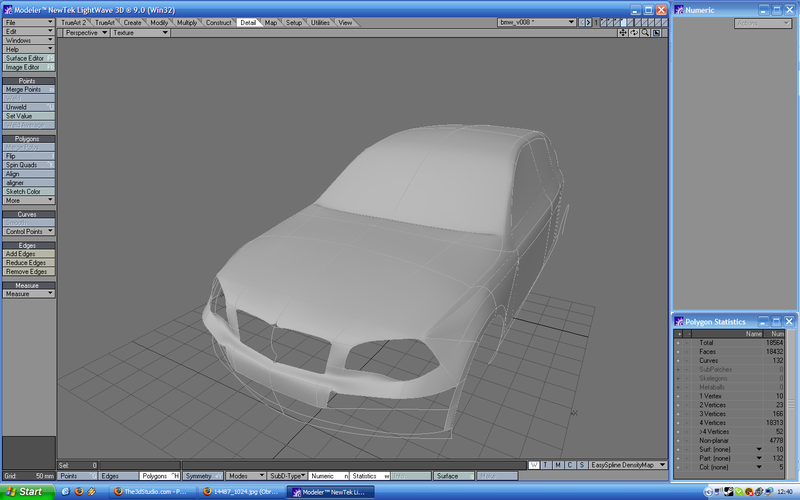 This is essencial feature for people modeling cars, airplanes and other vehicles using blue-prints that can't use LightWave's Auto Patcher due to using long curves. Introducing new modeling techniques: spline extruding/extending and converting polygonal model to spline cage. 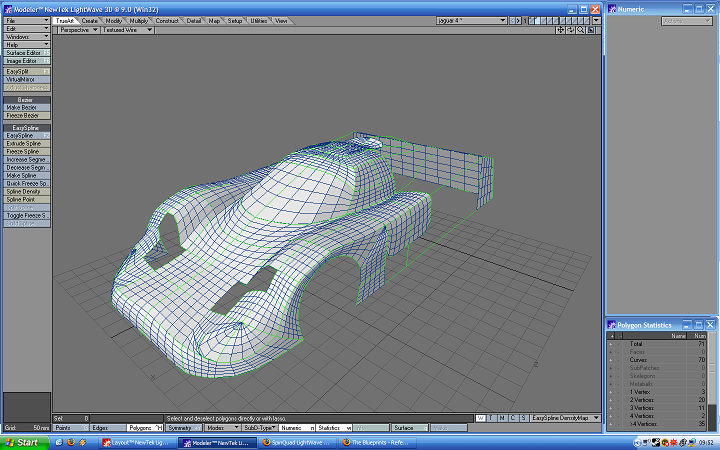 EasySpline - custom polygon handler for previewing spline cage in the real-time displaying wireframe and geometry. It constantly analizes layer where it was activated and as soon as requirements are meet, virtual spline patches are displayed. 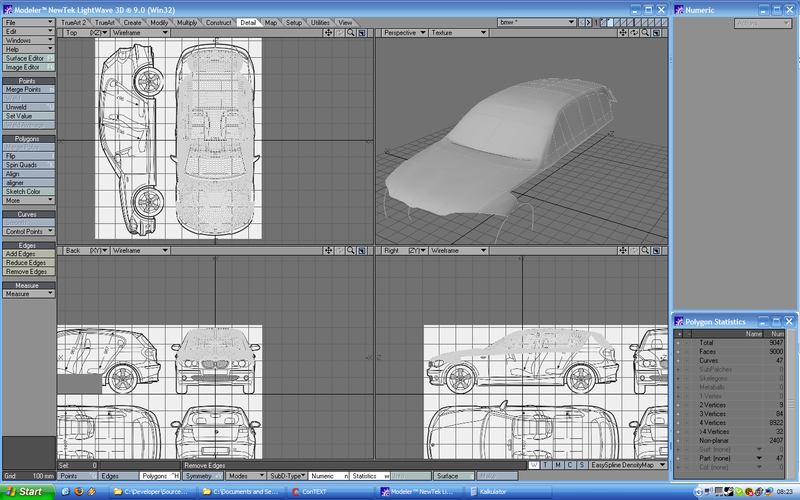 You can use any LightWave interactive or non-interactive tool, or 3rd party like f.e. LWCAD and spline patches will be instantly updated! No need to drop current tool or hit any hot-key to update virtual spline patches! Preview Spline - interactive tool for adjusting EasySpline previewing settings. Point and spline highlighting feature can be enabled in this control-panel. 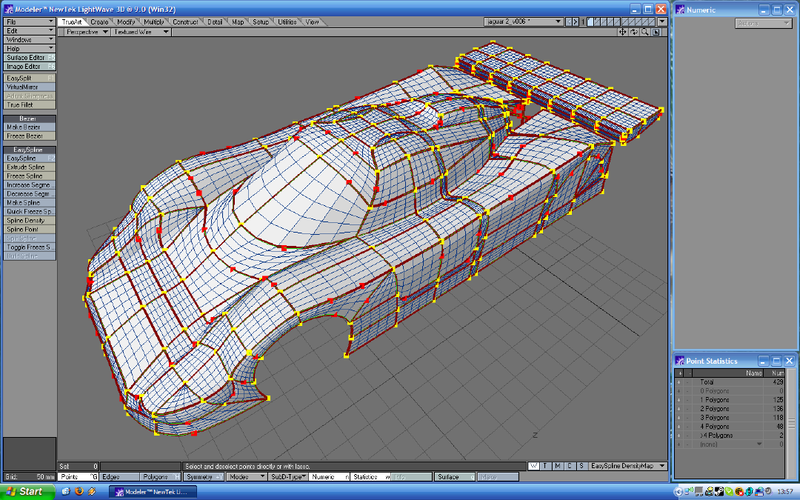 Freeze Spline - interactive tool for freezing spline cage to regular polygonal geometry. You can click Segment control slider and adjust it in the real-time until getting satisfying you result. Quick Freeze Spline - non-interactive tool for quickly freezing spline cage. Uses parameters set previously in Freeze Spline. Toggle Freeze Spline - non-interactive tool for turning on or off frozen spline cage. It deletes only what Freeze Spline, Quick Freeze Spline or Toggle Freeze Spline generated, other polygons remain untouched! Geometry to delete is detected by its part name. UnFreeze Spline - interactive tool for unfreezing spline patches frozen by Freeze Spline tool. It's speeding up process of removing polygons in unwanted areas patched accidently. Increase Segments non-interactive tool for increasing spline freezing segment by 1. It's time saver equal to going to interactive tool Preview Spline control-panel and increasing segment control there. Decrease Segments non-interactive tool for decreasing spline freezing segment by 1. It's time saver equal to going to interactive tool Preview Spline control-panel and decreasing segment control there. Spline Point - interactive tool for adding or moving points on splines in one handy tool. 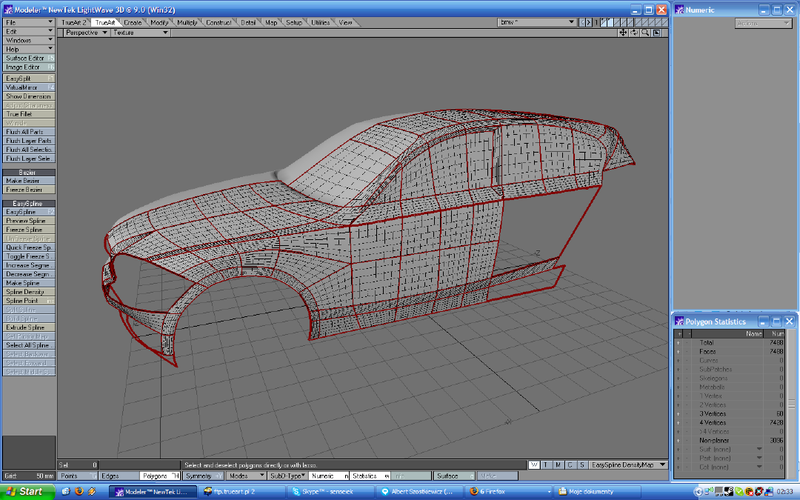 Once you will use it you will forget about LightWave's Drag Tool and Add Points! Cross Spline - non-interactive and interactive tools for crossing two Catmull-Rom splines. Splines will be connected in the closest position. Build Spline - non-interactive tool for splitting splines used by selected points and creating new splines between them. 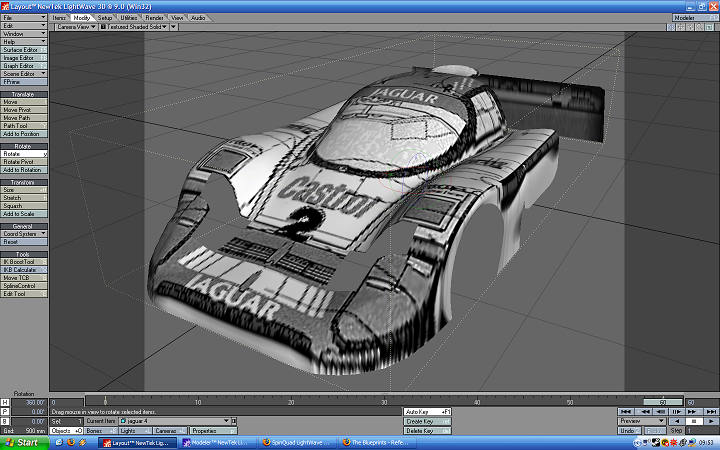 Useful if you wish object still to be compatible with LightWave's Auto Patcher. Make Spline - non-interactive tool for creating splines. In Point mode it converts group of selected points to group of two vertices splines. 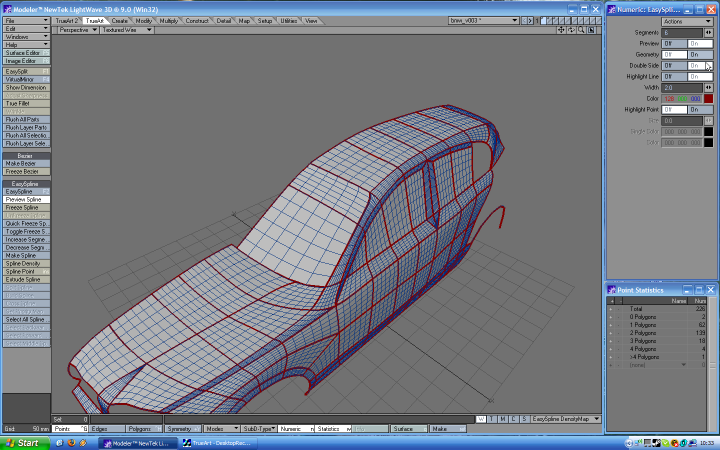 In Polygon mode or when there is no selected points it converts the all polygon edges to two vertices splines. Together with Spline Point and/or LightWave's Unify Polys it's the fastest way for making very complex spline cage within seconds from polygonal geometry. Split Spline - non-interactive tool for splitting splines. 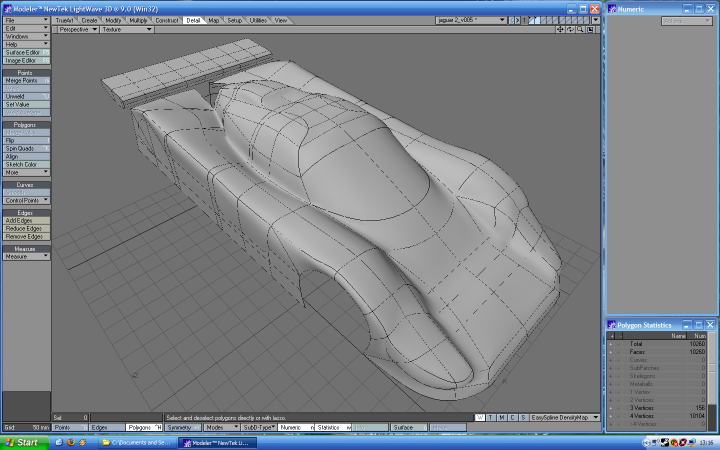 Similar to LightWave's Split but does not require to select curves, just points. Extrude Spline - interactive tool for extruding selected splines or the whole spline cage at once. Newly created splines become selected therefore you can immediately use LightWave's modifing tool like Move, Rotate or Stretch and working similar way as traditional edge extending but with splines! Spline patches knots are preserved. Extend Spline - non-interactive tool for extending selected splines. Like Extender Plus leaves new geometry in the same place as they are before using tool, and you can use any modification tool to move, rotate or rescale. Spline patches knots are preserved. Disconnect Spline - non-interactive tool for disconnecting the all selected long splines to group of small smoothed splines which preserves original shape. Disconnection is done in spline patches knot points. Smooth Symmetry Spline - non-interactive tool for smoothing splines which are on symmetry axis, to have smooth transition between left and right sides of spline cage. Spline Density - interactive tool for quantizing spline to user definable number of segments. Select All Spline Points - non-interactive tool for selecting the all points of splines that have some selected points in Point mode. In Polygon mode, the all points are selected and mode is switched to Point. Select Forward Spline Points - non-interactive tool for selecting the all points on spline after the first selected one. It works only in Point mode. Select Backward Spline Points - non-interactive tool for selecting the all points on spline before the first selected one. It works only in Point mode. Select Middle Spline Points - non-interactive tool for selecting the all points on spline between the first and second selected one. It works only in Point mode. EasySpline installation is more complex than other LightWave plugins, mostly because there is large number of tools in this system, and using it through Utilities > Additional has completely no sense. In LightWave v9.0 you will need to close Modeler after adding plugins, it'll crash but plugins will be added successfully. In LightWave v8.5 everything is fine, and we hope so this bug will be soon fixed in LightWave v9.x product line. 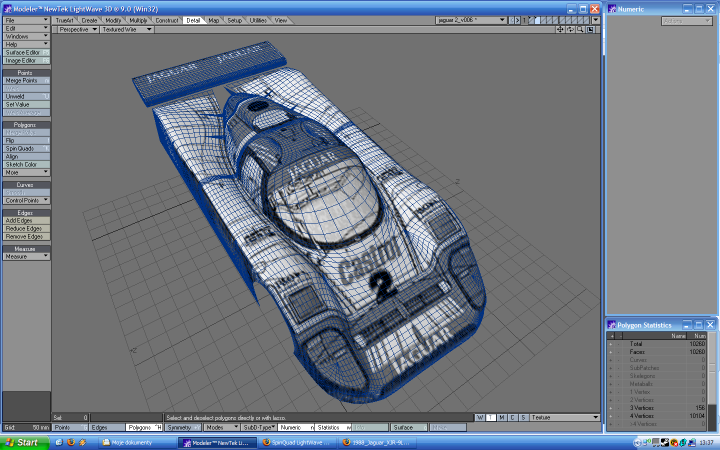 After relaunching Modeler, open Edit Menu Layout window and search for "EasySpline". You should see a lot of tools with such prefix. Make "TrueArt" menu, with "EasySpline" group, and start dragging and dropping tools one by one. Keep them in logic groups for easier usage: freezing, selecting, and spline modifing together. It's suggested to assign short-cut keys for at least EasySpline non-interactive tool that enables/disables real-time previewer and Spline Point. In the video EasySpline is assigned to F2, and Spline Point is assigned to Insert key. EasySpline_PolygonHandler that you can see in adding plugins status window has no interactive or non-interactive tool that you can add to menu, but it's essencial LightWave's core element that is used by everything else. Download animation (5.511 MB) illustrating EasySpline system installation and basic setup. Unlike traditional spline modeling where you decide what will be polygon flow in triangle spline patches by order in which splines are selected EasySpline has special tool for doing it permanently that works regardless how many times real-time previewer is switched on/off, or true geometry is generated and deleted. Set Priority Map requires directly selected points, which will have set the highest EasySpline PriorityMap weight map value. Download animation (7.613 MB) illustrating EasySpline triangle polygon flow controlling tool. SplinePoint is interactive tool to create new point on spline, or to drag and move existing point on spline to new location. Position can be snapped in any axis you wish to grid with specified offset and size. EasySpline introduces to LightWave enhanced selection toolset: Select All Spline Points, Select Forward Spline Points, Select Backward Spline Points and Select Middle Spline Points. Select All Spline Points is the only tool that works in Point, Edge and Polygon modes, the all others are only working in Point mode and need directly selected at least one point. 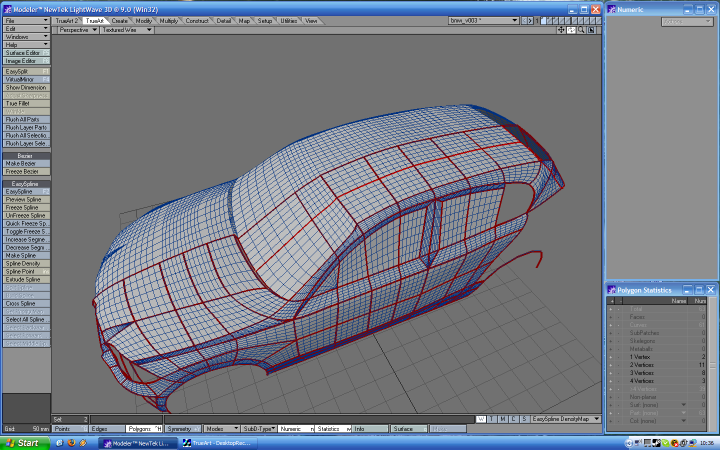 Video is showing EasySpline Preview Spline, Spline Point, Extrude Spline and VirtualMirror tools at work. Change YouTube quality to Full HD! Video is showing difference between EasySpline Preview Spline, Freeze Spline and built-in LightWave Patch and Auto Patcher tools. Change YouTube quality to Full HD! Video is showing EasySpline installation and setting up. Change YouTube quality to Full HD! Download animation (25.446 MB) illustrating general EasySpline real-time spline patching, VirtualMirror and point and spline high-lighting feature! Download 1st animation (1.186 MB) illustrating Spline Point tool in work! Download 2nd animation (4.754 MB) illustrating Spline Point tool and real-time spline patching in work! Download 3rd animation (4.564 MB) illustrating Spline Point tool and real-time spline patching in work! Download animation (9.565 MB) illustrating Extend Spline tool in work! Download animation (11.540 MB) illustrating Spline Lathe tool in work! Download animation (7.613 MB) illustrating Set Priority Map tool in work! Download animation (30.735 MB) illustrating UnFreeze Spline tool in work! Download animation (32.300 MB) illustrating Smooth Symmetry Spline tool in work! Download 1st animation (9.733 MB) illustrating Cross Spline tool in work! Download 2nd animation (26.240 MB) illustrating Cross Spline tool in work! Download animation (1.252 MB) illustrating EasySpline selection tools in work! Download animation (3.611 MB) illustrating Spline Density tool in work! Download animation (17.168 MB) illustrating repatching technique using splines! Download animation (26.709 MB) illustrating complete spline modeling and texturing technique using EasySpline! Download animation (60.264 MB) illustrating industrial modeling using splines! It shows real-time spline patching, spline and point high-lighting feature, using Bezier curves, extruding and freezing splines and much, much more. The first official EasySpline release for Windows 32 bit, 64 bit and Macintosh! The price for a single license (product installed on the one machine) is 75 USD (United States Dollars).